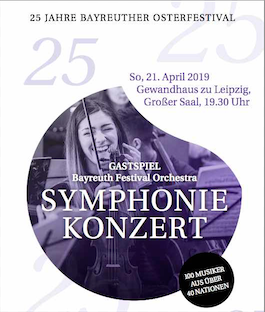 In the 18th year the social and cultural foundation INTERNATIONALE JUNGE ORCHESTERAKADEMIE (IJOA) presents charity concerts to the benefit of children suffering from cancer. Since 1995 the Bayreuther Osterfestival takes place every year at easter, accompanied by the Osterfestival Nördliche Oberpfalz and the tour visiting Selb, Jena and Bielefeld. The Akademie was founded in 1993 in cooperation with Prof. August Everding and the famous australian conductor Sir Charles Mackerras and has so far raised over 700.000 € for charity in over 400 concerts on 17 tours in German and European cities. Next to classical music the IJOA also stages Jazz- and Brass-Ensembles and a Salonorchester in the course of the festival. Since 2004 the internationally well-known conductor Maestro Miguel Gomez-Martinez has been GMD of the Akademie. The orchestra is annually assembled from talented young musicians from all over the world - until today there have been musicians from 60 nations taking part in the Internationale Junge Orchesterakademie. 2. international understanding: the orchestra of the Internationale Junge Orchesterakademie is annually gathered with Musicians from all over the world with a special focus on conflict areas such as Iraq - USA, Israel-Palestine or North- and South Korea. This allows the young people to find access to each other on a peaceful basis. 3. the promotion of culture, especially music: The assembly of young high-level-musicians and future professionals results in the formation of an excellent orchestra - every year anew.